Avoid people to cheat on your server for free ! Hey people of internet ! And I'm realeasing this for FREE ! 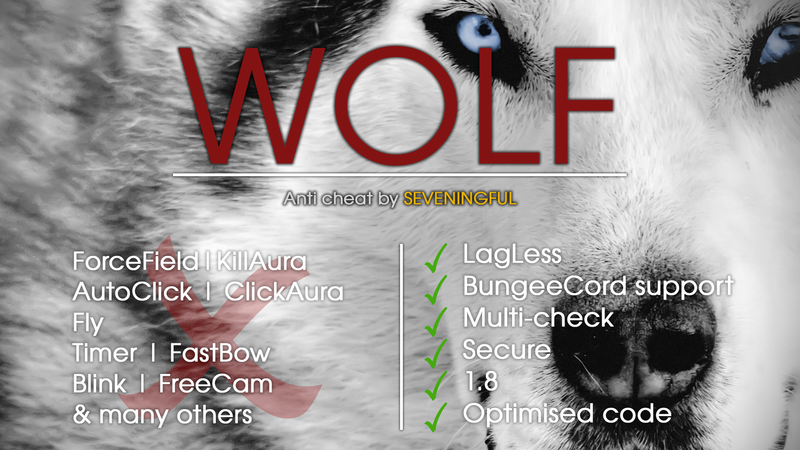 Wolf is a hack detector, using packets, maths & many other things to say with 90% certitude if the players is hacking ! It's a standalone plugin wich means he can work alone, he doesn't have any dependencies (not even ProtocolLib). What can Wolf detect ? IMPORTANT: There are 2 jars in the .zip file, one is the SERVER plugin & the other is the PROXY plugin. If you're using BungeeCord you need to install the SERVER plugin too ! Im_Amazeballs, sandeep, Via and 16 others like this. Excelente AntiCheat, bloqueou varios hacks que o nocheatplus não detectava, só não detecta Knockback, parabens! Excellent AntiCheat, blocked several hacks that nocheatplus did not detect, only does not detect Knockback, congratulations! Better then no cheat plus. Blocked my flight, no fall, water walk and timer. Good job!